In May, DogTime.com reported on the story of a lost dog, found and trained as a service dog by a Corvallis, Oregon college student and then spotted some months later by a man who insisted he was the dog’s real owner. Jordan Biggs, the Oregon State University student who discovered Chase running loose and decided to keep the dog when she says she was unable to find his original owner, is now battling felony theft charges for refusing to return the Husky mix to the man determined to be the dog’s owner, Portland resident Sam Hanson-Fleming. Hanson-Fleming adopted Chase when the dog was just a pup. Sixteen months later, Chase jumped a fence and ran off. Biggs found the dog in Portland soon after his escape. She returned to Corvallis that same day with the Husky mix. Two months later, Biggs named the dog Bear and took ownership of the dog. She paid for veterinary checkups, the dog’s neuter surgery, and a series of training classes at the end of which “Bear” became her asthma therapy dog. “Bear” was in Biggs’ possession for roughly 13 months when, on a visit to Portland to see her mother, she and the dog stopped at Dutch Bros. Coffee. There, while waiting in line, she was approached by Sam Hanson-Fleming, who insisted that “Bear” was really his long lost dog, Chase. After initially agreeing to return the dog to Hanson-Fleming, Biggs then refused. What ensued was a bitter legal battle between two parties who claimed ownership of the same dog. On July 10, Multnomah County Animal Services determined that Hanson-Fleming was the dog’s owner, but Jordan Biggs still refused to give up the dog she’d cared for, trained, and loved for over a year. July 20 Biggs was arrested on felony theft charges and Corvallis police seized Chase. After a five-month custody battle, Benton County Circuit Judge Locke Williams ordered Thursday morning that Chase be released to Hanson-Fleming. Chase and Hanson-Fleming were reunited Thursday at the Oregon Humane Society, where the dog has been staying for the past two-and-a-half months of the custody battle. The Oregonian reports that, upon seeing Hanson-Fleming and the man’s 7-year-old son, Talon, Chase excitedly jumped into the air and then planted a huge kiss on the little boy’s chin. 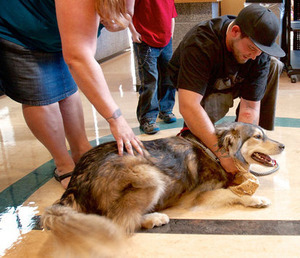 In an act as ceremonial as it was practical, staff at the Oregon Humane Society reprogrammed the dog’s microchip before sending him home, changing Chase’s owner from Jordan Biggs to Sam Hanson-Fleming. Though Chase went home with Hanson-Fleming, the legal war is not over. Biggs will have to stand trial October 24 for the theft charges filed against her. Biggs has filed a civil lawsuit against Hanson-Fleming; the two are expected to meet in court again this fall.